“I am not ashamed of the Scriptures. I honor them as God’s word given to the church to lead us into salvation. I am not ashamed of them, but I am chastened by them. I am sobered by them. I am convicted by them. I’m grateful for them,” so declared Dr. David Watson as he addressed the 2018 Global Gathering of the Wesleyan Covenant Association on November 3. 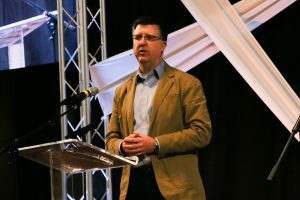 Dr. Watson, Academic Dean, Professor of New Testament, and Vice President of Academic Affairs at United Theological Seminary in Dayton, Ohio, addressed the more than 2,500 people in attendance at the live venue and 105 simulcast sites boldly affirming his commitment to the authority of Scripture. You can watch and download the entirety of Watson’s message by clicking on the play button below. You can also watch and download other messages from the 2018 Global Gathering here. Additional messages from this year’s Global Gathering will be released in the coming days.